We decided to go and find out the best cross trainers for overpronation. Trying to keep fit is really no fun at all when your running or walking style forces your ankles to push inwards a little (called over pronation). It’s caused by your arches under your feet falling (otherwise known as flat feet). What is over pronation of the foot? The above image shows a right hand side foot. As you can see that being overly pronated in your ankle means that the arch under your foot has fallen, and this fallen arch leads to the ankle leaning or being pushed inwards, forcing pressure onto the ankles, knee joints and possibly even the hips. It can also lead to all manner of pains in the feet as you try and compensate using your other foot more. If left untreated you can develop a number of issues such as plantar fasciitis, heel spurs and joint pains around the knees and hips. Can you fix flat feet? Through various exercises (shown below) you can help deal with flat feet issues. There are the usual medical or designed “things” you can purchase to help give immediate relief, but bear in mind that these are not allowing your feet to support themselves properly, rather they are making your feet become lazy, and may lead to further problems a few years down the line. So it’s best to look at exercises to help your foot support itself. There is no cross trainer designed to support overpronation that we are aware of, as they simply provide a platform for feet in general, and do not support your own arches under your feet. The truth of the matter is that no single cross trainer will adequately support overpronation. You really only have TWO OPTIONS. You can use straps and supports to try to keep everything in place when walking and exercising, or you can use exercises to help correct forms of pronation in the ankle. This is generally the advice given out by doctors and corners most of the market for sufferers. You can find most of the above products on Amazon (you can see them here). The idea behind these is that they somehow try to artificially keep an archway under your foot instead of the feet sitting almost flat on the floor. The ankle supports try to add some rigidity. Gel supports are small gel type shaped pieces that stick to the underside of your arch. Insoles / orthotics and shoe and trainer insoles that have a bulge where your arch would normally be and by placing your foot on top, keeps the arch higher. Overpronation trainers have thicker cushioning and support where it is needed for people who walk in this way. These are also known as motion control shoes. Custom made shoes usually cost a few hundred pounds and are made to “your” exact foot size so will be a perfect fit to support your foot how it should be. The positive things about the above are that they instantly help provide some relief, and can transform your every day life. Pain is gone for many people. This alone can not be underestimated. The negative things about them are that you can physically feel a bulge under your foot with, and it will be even more so pronounced if the fit is not perfect. However bear in mind that many people find them not to be a problem, and get used to them pretty quickly. If you like these videos there are a lot more videos available on Youtube that discuss over pronation, normal pronation and under pronation(supination or neutral pronation). So the first step is to figure out exactly what sort of person you are in terms of how you take physical steps with your feet. Do you naturally walk perfectly, or do your own feet tend to roll inwards or outwards? How can you find this out? 1: Look at your existing trainers. Place them on the floor side by side, as though on your feet. Look for their wear. Are they more worn on the insides (meaning you’re an overpronator), or more worn on the outsides (supinator) , or worn equally (normal walking)? If you’ve had them for some time you may even notice the shoes tilt in towards one another if your overpronation is particularly pronounced. Place a camera on the floor, and with no shoes, socks or trousers on, walk away from the camera in a straight line. Replay the video to see how you walk. 3: Look for a “Gait analysis” centre in your local area. Many sports shops (DW sports did for me) have a trained expert who can video you on a treadmill, and review the footage with you. These pronation tests are usually free in fitness stores but always ask first. They will then recommend the best overpronation running shoes to help you get to your fitness goals. 4: Refer to a podiatrist if you notice anything unusual such as pins and needles. It’s always safest to get professionally checked over if you have any unusual feet issues such as numbing, tingling or pins and needles. They can get to the bottom of any issues. If you are at all unsure, then please do make an appointment with your GP for a hospital referral to rule out any major issues. So I hope that this has helped you. The main take away from this is that to support your own feet you need custom made solutions, not a factory built cross trainer. When on the cross trainer, (or even when out running for example) you need to try to restore your foot balance. using any of the above products designed for flat feet will be a great start and provide you with the ability to get back on with your life. As you look then to the longer term, try to start doing some of the feet exercises a few times a week, so that eventually you won’t need to use any of the physcal products all the time, or never again. What is it called when you walk on the outside of your foot? The answer is under-pronation, or technically known as “Supination”. Is Overpronation the same as flat feet? For arguments sake, you can refer to both as being the same. A flat foot indicates your foot is flat while bearing weight on it (even though an arch can re-appear when sitting). Overpronation technically refers to your foot while it is in motion. It’s the movement of your foot as you walk or run. What can happen if I don’t get these corrected? Well the pains and aches won’t simply go away. They will keep re-ocurring. Over pronation puts stress and pressure on all parts of your feet, knees and legs. You can end up with stuff calf muscles, heel spurs, plantar fasciitis and more. Longer term you could end up with more permanent aches and pains that affect your mood, your walking style and your day to day existence. It really is no fun. Does my weight affect flat feet? Absolutely. For me this was the case anyway. My job many years ago was walking many miles on a hard concrete floor around a large manufacturing plant. My knees would hurt every week (even though my feet didn’t). I was diagnosed with fallen arches at the medical centre. I used orthotic insoles which helped a bit, but the only thing that made a big difference was when I lost 5 stone in weight. I have not suffered from any feet related issues ever since, and that is now 15 years ago. Did you find this article useful? If so please share this. Please also consider taking a look at our best recommended cross trainers. Fitness can be fun. A cross trainer can target many muscles, but which is the best cross trainer out there? Some are way better than others, and some are simply over priced. Our cross trainer reviews are based on research, REAL WORLD testing and a thorough writeup by our team of hard working writers. Want to get a good all round level of fitness with improved health, muscle tone and skin? A cross body trainer helps you achieve all of this. Instead of paying out for a contracted gym equipment membership you could choose instead a “cross trainer” machine for your house and get the same benefits. Plus you’ll actually have something at the end of it. Let us do the hard work and discover the best home cross trainer with you. Our OVERALL favourite to come out of our testing in the list is the JTX Strider X7 Magnetic Cross Trainer – An epic performer with fantastic credentials. This wonderful machine gives your body a full workout and is ideal for raising your fitness levels, losing weight and feeling better about yourself – all from the comfort of your own home. A cross body trainer will get you much fitter and slimmer without the hard hitting wear and tear that you can sustain on your knee joints from running (the impact can be as much as 2 to 3 x your body weight if you are overweight (see here for facts (opens in a new window)). After all our “exhaustive” jogging pants wearing testing, our conclusion is that the JTX Strider X7 Magnetic Cross Trainer is our main favourite in terms of price and features. All the others in this list are so close in terms of second place that it’s hard to choose between them. When you purchase one, it is highly advised to get a rubber mat. Here is a nice cheap option at round £14 that interlocks. This helps silence the noise plus also helps keep the floor protected. This is so much BETTER than entry level, and really does offer superb pricing and performance. It’s the XS Sports Pro 2-in-1 cross trainer. When looking for a suitable trainer, bear in mind the features you’d like and of course what sort of budget. It is possible to purchase a cross trainer for “well under” £100 and at the other end spend high 3 or 4 figures on one. A great cross trainer for under £100 (typically). A BRILLIANT premium high end cross trainer for under £500 (typically). A BRILLIANT mid priced cross trainer for WELL under £200 (typically). Our Best Low Cost Choice! A superb entry level machine at a superb price - under £100 (typically). So much better than "entry level !" A BRILLIANT mid priced cross trainer for around £200 (typically). Our Best Mid Priced Choice! A superb mid-priced cross trainer at a superb price - under £150 (typically). A design and build masterpiece. A BRILLIANT premium high end cross trainer for around £700 (typically). Connect to a free app on your phone or tablet to work ouot anywhere in the world virtually. Using a cross trainer or any form of exercise equipment can be REALLY good for osteoarthritis. Stop those painful flare ups. Here’s an article in the Daily Express about it. So what is a cross trainer? In essence it is a piece of low impact fitness equipment that aims to work the majority of the muscles on your body, so that your whole body gets a workout. In fitness terms, this is a great bit of kit as targeting multiple muscle groups helps strengthen your whole body and as a result suffer from fewer injuries, and enjoy faster recovery times. What sort of room do they take up and would you get along with it? This isn’t a piece of kit you can can use sat down in front of Coronation Street or Men & Motors channel. You stand up or sit on the machine and you legs will be moving while your arms also move. The ones with seats attached are called “2 in 1” machines. Some will let you remove the seat for stand up cross training, however true cross training enthusiasts will claim that it has to be “no seat whatsoever”. 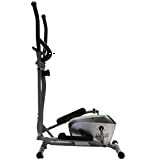 Professional and also lower priced fit trainer machines. You could happily opt for some of the best cross trainers around such as this life fitness X1 cross trainer (pure gym quality brilliance, as is the proform endurance cross trainer range at half the price of life fitness machines), or choose modellike the York cross trainers that score very well (adequate for most people) like the York fitness active 120 cross trainer at low to mid 3 figure price bands or even down to very low figures (York cross trainers do come fairly well recommended although they don’t always score quite so highly as others). Whatever your needs, weve picked out the “best”. Some cross trainers let you pedal backward as well as forward so that you can target both the front thigh muscles and the rear thigh muscles. We think this is a “must have” feature to maintain good all round strength. Ever imagine gardening would be as good as using a cross trainer? Read how one person came to this realization while doing some work in their garden recently. So let’s take a closer deeper look at each of our “best 10”. Remember these have already been weeded out from the rest of the ones for sale due to their strong features, price points and build quality. 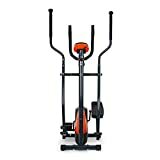 Is this the best elliptical trainer uk wide? Quite possibly, certainly ranked very highly as a favourite! We like the JLL brand. Affordable and yet highly adjustable. A company who know their target audience and create the right cross trainer machines for them. This model, the CT100 has the seat meaning you can also use it like riding a bike. Perfect for those who need a low impact bike and cross trainer. 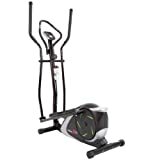 This is the JLL Fitness 2-in-1 Elliptical Cross Trainer & Exercise Bike. Dual purpose doubles up as an exercise bike and Cross trainer for maximum workout potential. Max user weight: 110kg (17.3 stones in weight) although as it is robust we feel you could get away with more. Fully adjustable multi level resistance to increase work out intensity – simply turn the resistance knob located on the frame down between your legs when stood on it. Multi Function LCD Display: Pulse, Time, Speed, Distance and Calories burned. Front Mounted Flywheel for extra stability. 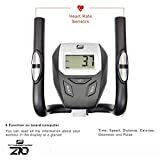 Dual Action Handlebars and Fixed Bars with Pulse Sensors to Monitor Heart Rate During Workout. Could this be the best home cross trainer ? Can it be used by short and tall people? Does the seat get in the way when youre using it? Does it come already built up? Nope sorry. You have to do a little bit of assembly which is pretty straightforward. You’ll need to fit the pedals, seat, handlebars and display on. All tools needed to put it together come with it when you order. Want to find out more? Click here to view it over on Amazon. 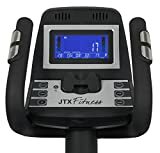 If you are aiming for a cross trainer that is much like a gym machine but without spending 4 figures then the JTX Strider X7 may just be the perfect solution. We have tested this (well one of us was lucky enough to have done) and the overwhelming verdict is that it is a brilliant cross body trainer (if aching the next day is anything to go by). During normal use (2 to 4 times per week) the Strider X7 is very quiet and smooth running, with very little vibration and feels very sturdy. It is a premium cross trainer in terms of price and features but you get what you pay for. We liked this machine as it’s obviously very high quality and customer service is exceptionally good. 28 day money back guarantee. 5 Year frame warranty and 2 Year in-home repair warranty including all parts and labour. Compact but robust design with a maximum user weight of 110kg (17St 4lbs). Fantastic customer rating on this machine! Take fitness to new levels this year! Will this machine indent the carpets in my home? We were overall fairly impressed with this trainer. Not too expensive to buy and the build quality is good. You can pedal forwards or backwards to suit your exercise regime and target both front and rear muscle groups in your legs. Comes with a large LCD display that shows you time, speed, distance, calories, pulse & odometer. At 5 foot tall can I use the bicycle part easily? Not ideally to be honest. There is upward adjustment for taller people but down to 5 foot makes it a little harder to use. Could this REALLY be the best cross trainer for the money? Enjoy full body workouts with the Xs Sports Pro XS cross trainer thanks to it’s full range of motion and 2 way crank allowing for both forward and backward pedalling (to target hamstrings at the back as well as the front of the legs). Fully adjustable seat handles and feet to ensure suitability for most people (maximum weight is just over 17 and a half stones / 110kg / 250 pounds). What’s the stride length like on this? It’s more like riding a bike with moving handles in essence so not a massive stride length but definitely a good workout. What’s it like for long term use? Perfectly fine. Several real customers have reported the same great use from their machines at the 6 months and upward time frames. Does the computer display have a back light? Can tall and small people use it ok? Yep, it works really well for people of most sizes even at very tall well over 6 foot. We lost 4 pounds weight in a week when used every day (and didn’t even change our diet). For complete value we cannot recommend this enough. 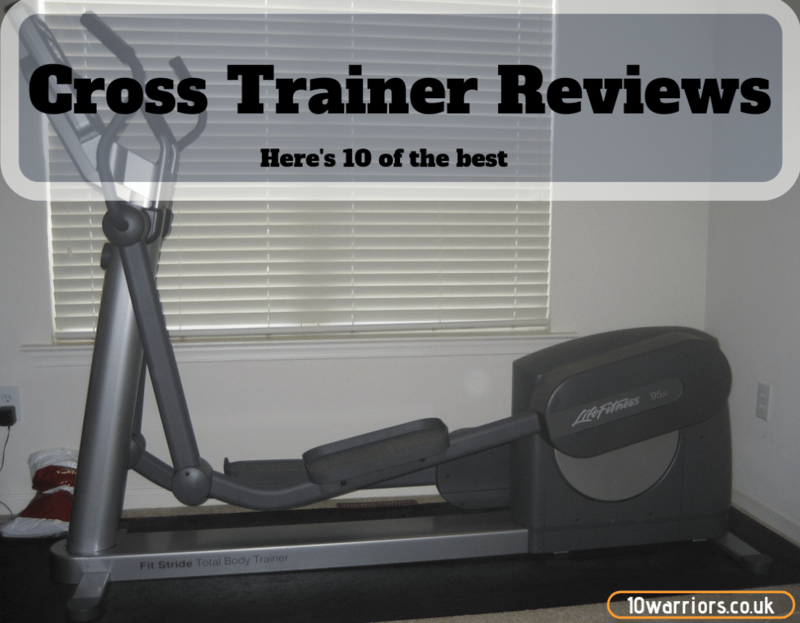 One of our favourites overall and possibly the best cross trainer right now. You might want to re-check and re-tighten nuts once or twice within the first 2 weeks. What’s not to love about the Klarfit? Being able to handle up to 15.7 stones in weight (100kg), this home cross body trainer impressed us right from the start. I’m a big person, will I fit on it? The Klarfit cross trainer is suitable for all heights – small and tall people alike can use it with ease so go ahead and order with ease. Is it a noisy cross trainer? No it’s a fairly quiet machine during use (although we can’t guarantee it won’t beg you to use it if you ignore it for a few days 🙂 ). We do advise buying some lubricant at yout earliest convenience to liberally apply to each of the six bolts that hold the peddles and levers. The machine can squeak after a few weeks, so unscrew the 6 bolts, pop in grease and tighten them all back up. You can make up your own mind and read some genuine purchaser reviews about it over on Amazon. All very positive about this. 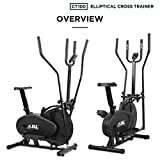 The Fitnessform P1100 X10 cross trainer is both a cross trainer and exercise bike so you can vary up your workout routine whenever you wish. The price point is nicely nestled in – not too expensive and not overly cheap either. We found that the unit was very compact compared to others. Can this be folded up when not in use? Can small and tall people use it just fine? If you need “brilliant” then we feel this matches expectations. The bodymax e60 elliptical cross trainer is a firm winner. It’s a solid fitness machine you can use to make big changes in yourself. Size wise this machine measures 5 foot 6 inches tall (to top of handles), 4 foot 8 inches in length and 1 foot 11 inches wide. Everything you need during use can be accessed via the monitor, except for your water bottle that is (a water bottle holder would be handy on the machine but there are other options such as a belt to hold your bottle). Pedal forwards or backwards on your Bodymax E60 via the circular motion and target most of your core muscle groups. It’s surprisingy quiet and perfect for an upstairs room. It isn’t cheap at close to £700 but boy is it a REALLY nice machine. See what others think about it on Amazon here. Enjoy extendable long strides (not normally seen on many cross trainers) to really work out hard. Connect it via Bluetooth to a FREE app on your tablet or phone and create training routes around the world (seeing the scenery as you work out!). With this free app your Tri-Fit will adjust the resistance as you travel through different sceneries. Almost like being there in person. 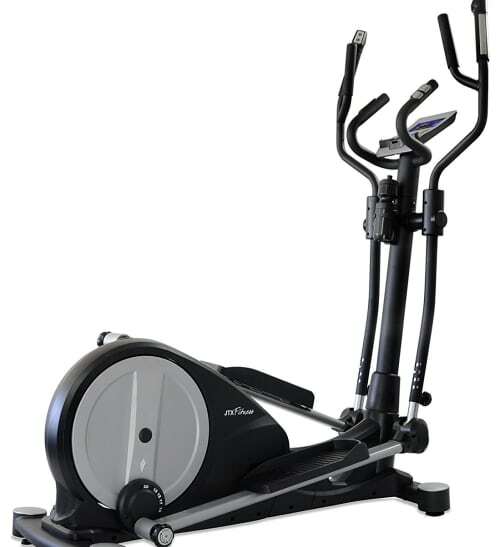 Robust cross trainer with variable stride length system (16- 20″), great for multiple users. Powerful electro-magnetic resistance & incline control. By training on an incline you will engage your core and glutes giving you a more complete full body workout. Combining the incline, resistance and long stride length makes this the ideal cross trainer for weight loss and improving fitness. I’m 6 foot 5 – will this be ok for me for the stride length? Yes. 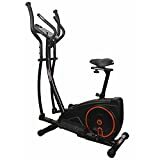 This machine is as good as gymnasium cross trainers, and offers a 20 inch stride length that is found in most gym cross trainers. With it being a home use machine, it’s been carefully designed to be about 30% shorter in length – perfect for a home environment! Viavito combines style with fitness and this is the result with this stunningly good looking low impact bike and cross trainer machine. The Setry is very appealing. User comfort is a positive here. The oversized feet plates make it easy to get the right position to suit you. They are 45cm at their highest point. The floorspace needed for this machine is 104 cm in length x 49 cm wide x 133 cm high. We loved the fact that this machine looks very stylish AND is well built. We also like the water bottle holder and the free water bottle (although when really full it fell out a few times so best not to overfill this). Take a look at the pictures and see how nice it looks. This cross body trainer is well engineered and stylish too! Ready to get toned fit and healthy? Assembly instructions were a touch difficult to follow unlike others. Can you lose weight with a cross trainer? Yes absolutely. An machine that forces you to “break a sweat” will get your heart pumping more and help you to lose weight. There are of course a million other things to factor in. Yoou will want to make sure you are cutting out the “bad foods” (takeaways, junk food and alcohol) and replace meals with healthier variants. You will also want to make sure you extercise regularly. I recommend at least 4 times per week. Not only that but if you incorporate “interval training” into your routine (sometimes called HIIT) it helps turbo boost weight loss as your body is burning calories hours afetr your’ve finished your workout. Interval training means you can get a VERY GOOD workout in just 20 to 30 minutes a day. Then for 30 seconds increase the effort to about 85% and increase the intensity or incline or resistance. Then repeat until you’ve had enough. Can you lose belly fat with a cross trainer? Yes you can. You will lose fat across all areas of your body when using a cross trainer. In fact any cardio equipment can help you lose belly fet and get a toned tummy. As long as you consume fewer calories than you eat you will ultimately create a calorie deficit in what you eat and this leads to overall weight loss, including your belly. Every day for a week or two, make a note of everything you eat and drink and note how many calories you have eaten each day. Ask yourself: Was this level of eating maintaining my weight or putting weight on? If it was maintaining your weight then you need to change a few of the foods or drinks for lower calorie options. An average pound of fat equals about 3500 calories, so to lose 1 pound a week you should aim to reduce your calorie intake by about 500 calories a day. You can also BURN off 500 calories a day through exercise to get the same result. If you want to lose a steady 2 pounds a week then you could burn off 1000 calories a day through exercise, or consume 1000 calories less per day, or combine both methods by burning 500 calories a day and eating 500 calories less a day. Do you have to spend a lot of money on a cross trainer? No, not at all. Some of the best cross trainers around are inexpensive. They serve a function but generally come without fancy bells and whistles that you would find on higher priced models. Which cross trainer fulfills this? Well, other than every single trainer on this writeup being superb, the best value cross trainer is the XS Sports Pro 2-in-1 cross trainer. Can a cross trainer give you a bad back? In general the answer is no. The upper torso (chest, belly, shoulders etc.) are all fairly in a straight line unlike many other forms of exercise. A cross trainer is considered a low impact cardio machine, which is good for your core fitness and weight loss. As with ANY exercise machine it is important that you warm up for 5 minutes by starting off slowly, and gently easing yourself into stronger movements. In addition, your stomach plays a MAJOR ROLE in the support of your back, so you do need to work on some stomach tightening muscles to help reduce the number of any back related injuries. Cross trainer or a treadmill – which is best? To work out which is better we needed to do a wee bit of research. This particular study favoured cross trainers but from my own personal point of view, it’s good to have a variety in life. There are definitely pro’s and con’s to both. While treadmill running is my own personal favourite (having run a number of half marathons), it can impact on knee joints further down in life if you have any gait related issues (flat foot etc. ), although I’ve never had any such issues. The good part of treadmill running is it is a natural flow for the body. It’s what we do. A cross trainer is not a natural movement. Your feet are planted still in one place, however the workout feels very refined and smooth and you get just as good a workout as a treadmill but the effort needed doesn’t feel anywhere near as much.